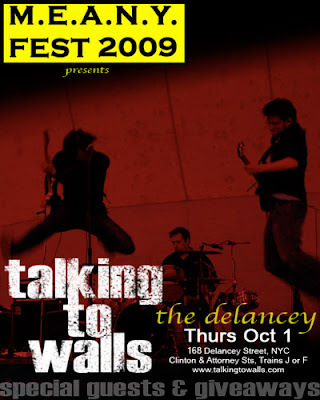 Those rockin' lads known as Talking To Walls are coming back to New York! Say wha?! Yes indeed fellow creatures known as New Yorkers, those CT boys are coming back. This time, they'll be taking part in M.E.A.N.Y. Fest 2009 ... that stands for Musicians and Emerging Artists New York ... yeah, I didn't know either. I'm not hip or down or with it or whatever the young whipper snappers are saying these days. They'll be at The Delancey on Thursday, October 1. I hear it's going to be the "greatest, wildest, most legendary show in Talking to Walls history" ... how could you even think about missing that?! They'll be shooting a video with Irish step dancers (really? wicked!) and just in general rockin' out. You should go and show some love or at the very least some highly energetic lust. And because you won't have gotten enough Talking To Walls, you'll want to go see them when they wreck havoc over at R Bar on Thursday, October 22. Really, you will!